Even in Michigan, there are hints of spring. While we can’t guarantee we’re snow-free yet, the dirty snow heaps are gone and I can begin to see buds on the trees. For many of you, spring break may be right around the corner. Here’s an idea for some family fun or art-lesson magic for your springtime delight: sidewalk chalk photography. We’ve had wonderful sidewalk art in Ann Arbor courtesy of artist David Zinn, but it had never occurred to me that those of us whose chalk-drawing skills are something less than magical could combine them with photography to create something new. Enter chalk photography. These images, available in abundance through Pinterest, use chalk to create basic images as backgrounds for (often small) humans to explore. Want to dunk a basketball? Draw the hoop and pose—on the ground—midair. Want to fly? Take a picture over a chalk-drawn landscape. Chalk photography is just plain fun, allowing all manner of adventures—grow butterfly wings, climb a building, take a high dive. 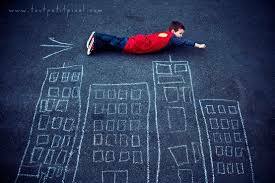 All you need is a few sticks of chalk, a blank area of concrete, and some imagination. 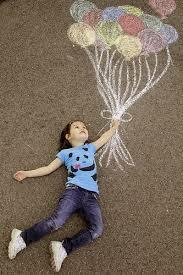 Aside from the imaginative joy of the process, chalk photography can also serve as inspiration for creative writing. Where is that girl flying? What was it like to have wings grow? Think about starting outside with photos posed on the playground or basketball court, then moving inside to write. What a glorious and creative spring afternoon that could be! If you live in an area where it is possible to lie on the sidewalk without freezing–or sticking–give sidewalk photography a try. In Michigan, maybe wait a month or two. . . .